Those blobs make all the difference IMO despite being a simple addition. Nice. That tree is the same one as in the jPCT demo's yeah? I slightly modified it to straighten out that pronounced fork in the trunk, removed 59 double vertices, rotated it natively for jPCT, and made some of the lower leave planes smaller so they don't stick out as much. It may improve performance a bit. 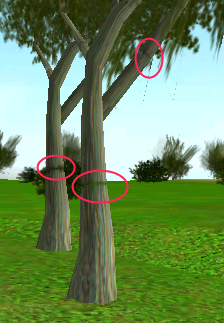 That tree doesn't work well...with backface culling enabled, there are missing leaves and with backface culling disabled, the trunk has wrong lighting, because polygons from both sides show through. Ah ok the double-sided normals option in blender is dependent on the renderer so it seems that jPCT doesn't support this feature. I created the double sided planes manually and flip the normals, those extra vertices are back in business now. Attached is the new tree. No, it doesn't. It's just some additional stuff added to the already existing texture that i use for texture splatting. Is it possible to make the trunk parts in question use texture coordinates that are a bit lower (i.e. farer away from the leave part of the texture)? 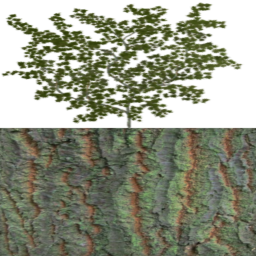 that's a bit odd, looks like your texture is different to mine since mine renders fine using transparency. That can easily be fixed but I need your texture to align it properly. OK, yeah, that's because I was having trouble in Blender. I'll go over it again. I'm going to need to figure this out anyway. I tried to sort of cheat and it backfired on me apparently. BTW, would you rather save the vertices on the lower part of the bow since it's not visible, or does that matter? I may need to add a couple loops right where that bend is so it looks better. It doesn't matter ATM, but i would rather keep them just in case. problem with that download, use link below. I could redo the bow if the bend doesn't look good, yet. There's only 3 animations without the arrow. Using the Armature system in Blender may get that bow bending correctly. Or if you are using Armature's, I feel your pain. It's a headache getting it working properly.. They say they are making Blender easier but I don't see it. It seems to get harder and buggier with every release. Still, it's amazing what people can do with it. Their new action system took me forever to even find it and I seem to get more bones than what I want and they automatically weight themselves even when I choose not to do it. It's getting better as I get more used to it. Page created in 0.848 seconds with 17 queries.